On Apokolips Granny Goodness alongside Desaad look over the city, worried for the future over the people believing Darksied has died. Upon Grannys questioning Dessads loyalty to Darkseid, he flies into a rage attacking her only to be knocked out by the newly arrived Kanto. The imperial city is then attacked by a squadron of Deathwings led by Vundabar.<br />An awakened Desaad then sends his army of Parademons to battle the invaders, as he questions Kantos loyalty. The three then agree to unite to defeat Vundabar and his invasion,attacking with Grannys newest weapon the Mark VIII Pacifier.Desaad then pilots the ship through the hordes of ship, infiltrating the mothership and bringing it down sending the soldiers to parachute out as Desaad captures Vundabar. 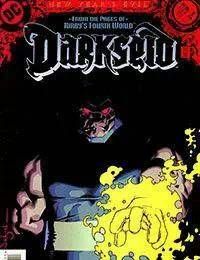 Meanwhile the falling ship is caught by the giant monument of Darkseid come to life, who tells them he has need for all of them to work together and he would remember this upon his escape. He then tells him to continue their assaults on New Genesis as he leaves the statue.